We serve alumni and undergraduate brothers. We find, connect, and inform our 1,600 Chapter alumni. We maintain this web site and its on-line directory, provide newsletters, and plan reunions. For the Chapter, we provide scholarships, financially contribute to leadership trainings, and provide fraternal displays that educate our men about our unique history, traditions, and bond. The DSP Chapter in San Luis Obispo’s alumni organization was honored with National’s prestigious Hugh “Cap” Ryan Award For Outstanding Alumni Association, on July 24, 2009, at National Convention in St. Louis, Missouri. Thank you alumni for your involvement and support. 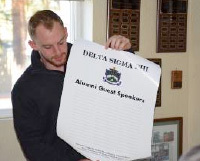 Our 2016 gift to the Chapter was the “Alumni Guest Speakers” Board. At the Chapter’s request, a new program was established in April 2016 and will be launched in Fall Quarter 2016. The program is “Alumni Guest Speakers”. 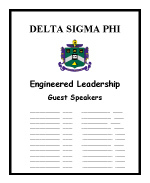 This will supplement the Chapter’s “Engineered Leadership” speakers program of University and community leaders. Alumni from various professions are asked to return, attend a Chapter dinner, and address our men with their “real life” experiences and insight. Our 2016-2017 Chapter President Luke “ORC” Pinkston displays the scroll that participating alumni will sign. 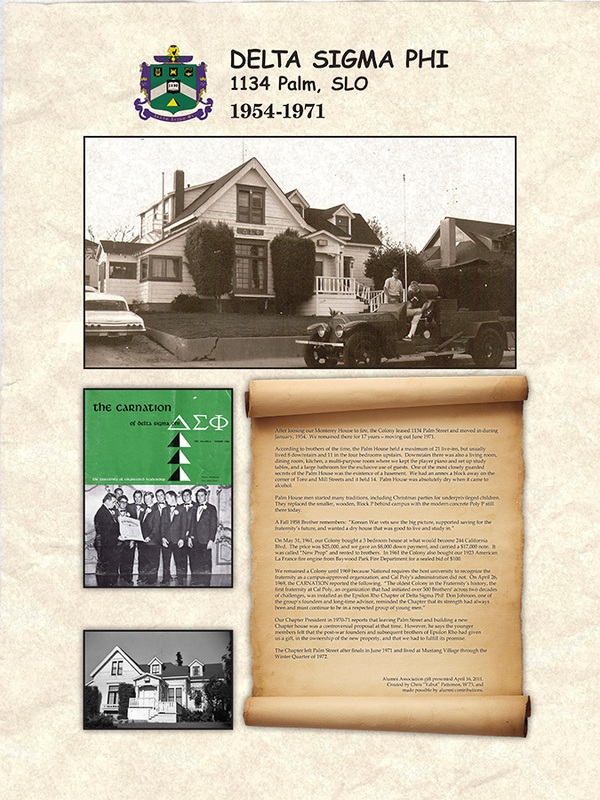 Our 2015 gift to the Chapter records our unique history - “Where Our Chapter Property And House Came From”! Brother Kerr, S’58, Brother Ferguson, W’70, and Brother Patterson, W’73, present the gift in April 2015. Click here for the text contained in this Chapter display. To encourage our Chapter to record its brotherhood events and life around the “House”, we gifted a digital camera system. As a result, our Chapter again appoints a brother to record Chapter events for the future. Our 2013 gift to the chapter was a large professional-grade BBQ. Long ago the City of SLO forced the chapter to remove the block and brick BBQ built against the Cal Park wall just outside of the kitchen. It was illegally built in the five foot side setback. Our gift supports daily dinner preparation in the traditional BBQ area - and group activities. This BBQ can be rolled through the breezeway to the back yard. 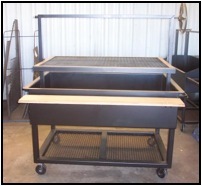 It is built of 3/8’s inch steel plate, weighs over 600 pounds, and has an adjustable grill of 40 by 60 inches. It is legal to park and use in the same spot as the old BBQ – because it is not permanently built in! Our actives were very, very excited to get this beast of a BBQ to support large-group activities! In 2012 our gift focused on leadership. In the name of our alumni, we researched, designed, had cast, and gave Exec officers the “emblem of office some of us wore, and all of us remember, from our chapter days. Each officer will convey his medallion to the next elected officer. This 4-decade-plus tradition was lost about 2000. In 2011 our gift focused on creating a “teaching tool” about our unique, three-house, history. 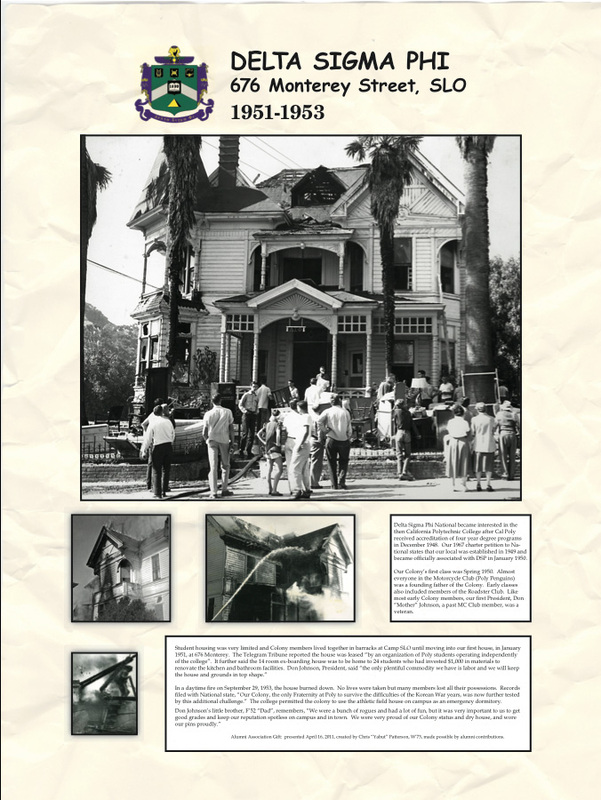 We custom-developed a set of house pictures – each with its unique history. They will continue to instruct our new brothers for many years to come. Before these gifts, we reinstated the EL Speakers Board and program. Using old photos, we duplicated the missing “EL Board” and returned this unique tradition to our chapter. The most notable speaker of 2012 was the University’s President Armstrong. Unlike ACB which receives rents from the chapter house, your all-volunteer Alumni Association is 100% dependant on alumni giving to cover our costs. You can help us continue our work for alums and chapter by becoming an Alumni Association member. Please send in your annual dues of $20 and a donation you‘re comfortable with. We maintain what we’ve built with dues – and give scholarships and instructive gifts with your donations. Your Brotherhood-from-afar makes our work for DSP possible. 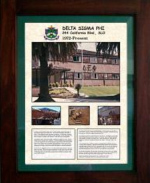 The Epsilon Rho Alumni Association of the Delta Sigma Phi Fraternity Chapter in San Luis Obispo is deeply indebted to the following alumni whose generous and unselfish project-specific donations made this site possible for all of us. 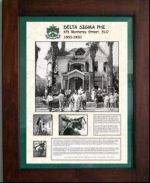 No matter how our Delta Sig alumni site changes over time, forever retain the following list of 82 Delta Sigs as the original FOUNDERS – with our sincere thanks for their Delta Sig spirit and continuing to pay-the-debt. 2	Current ACB or Alumni Assn. officer or volunteer. 3	Initial contributor of history or photos. 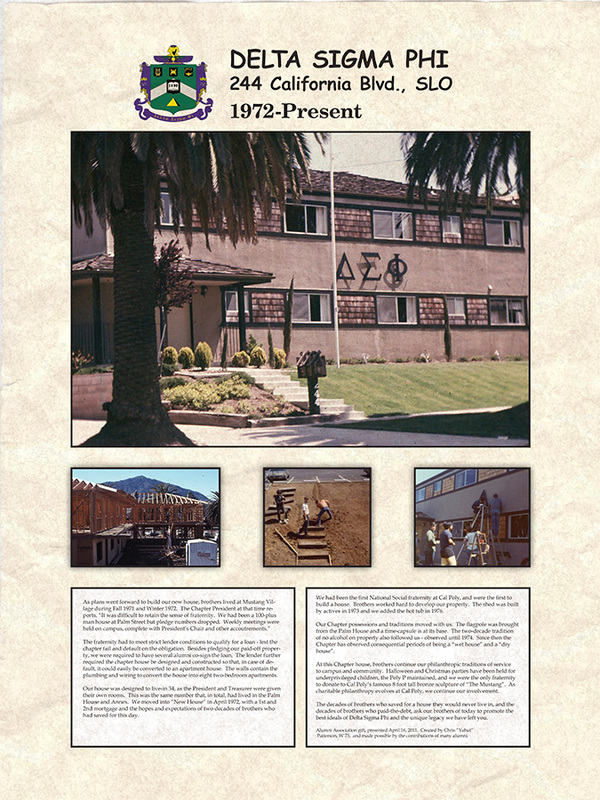 4 Chair of committee that researched, fund-raised, wrote, launched, and gifted this web site to the alumni Brothers of the DSP Chapter in San Luis Obispo. Steve “Rocky” Miller, S’71, also deserves mention for preserving our photos. 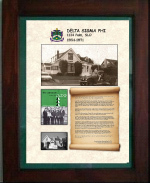 Fall 1975 was the only class to have 100% of its members become Founders. Our current membership drive asks all alumni to help us serve our chapter and alumni by joining our Alumni Association for $20 a year. Association officers are 100% volunteer but we need funds for essentials such as the scholarships and chapter gifts we give, for web site host costs, and for necessary printing and postage. You can help us from afar. Please click on printable form and surface mail this in with dues, and if possible, a donation. We invest it all in our chapter and its men – both actives and alumni.